1. 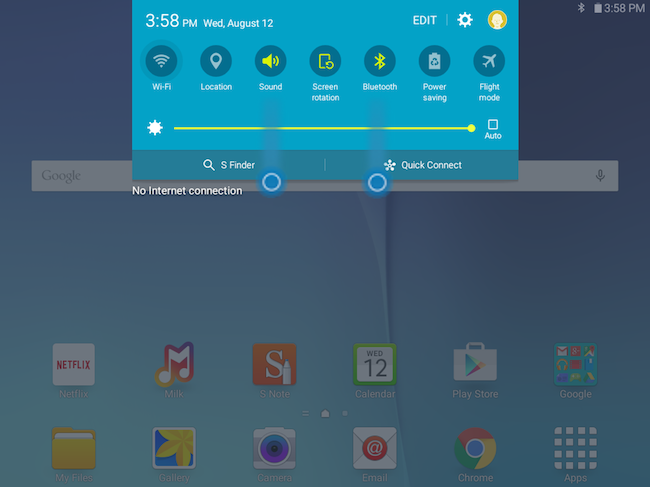 Open the Notification Panel by swiping two fingers slightly apart from the top of the screen to the bottom. 2. You will see the Wi-Fi icon at the top of the panel. You can touch the icon to turn Wi-Fi on . When Wi-Fi is on, it will scan for and connect to any previously connected access points, commonly known as the network. 1. From the Home screen, touch Apps > Settings > Wi-Fi . 2. If necessary, touch the slider to turn Wi-Fi ON . 3. 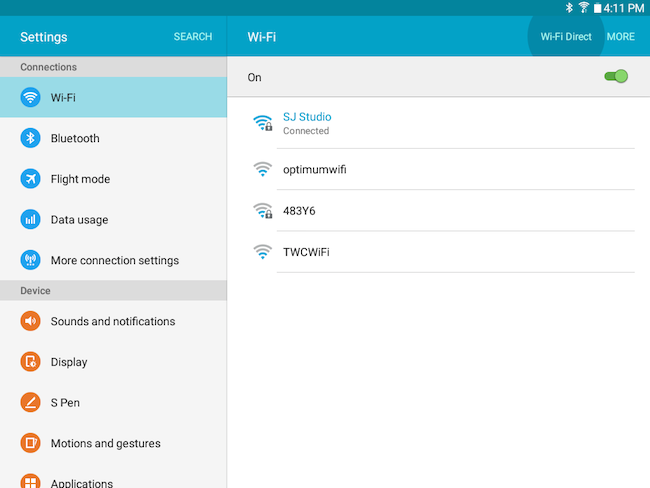 Available networks will display under Wi-Fi networks. Touch the name of the network you want to connect to. 4. Enter a password, if necessary, and touch CONNECT. 2. Touch MORE > Add network. 3. 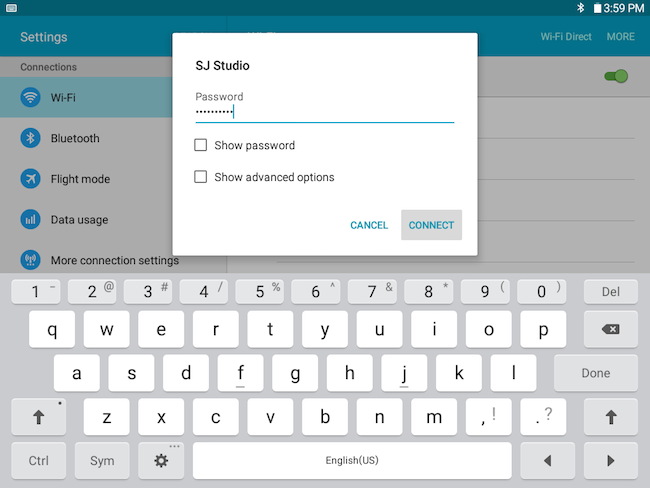 Enter the Network name. This is the name of the network you are connecting to. 4. Select the Security level of the network. If you select a security level that does not match your access point, you will not be able to connect. 5. If the access point is secured, enter the password. 6. You can mark the Show advanced options checkbox to configure the IP settings and the Proxy. 7. Touch CONNECT to store the new information and connect to the network. Note: To use WPS, your device must support WPS and be compatible with WPA security. 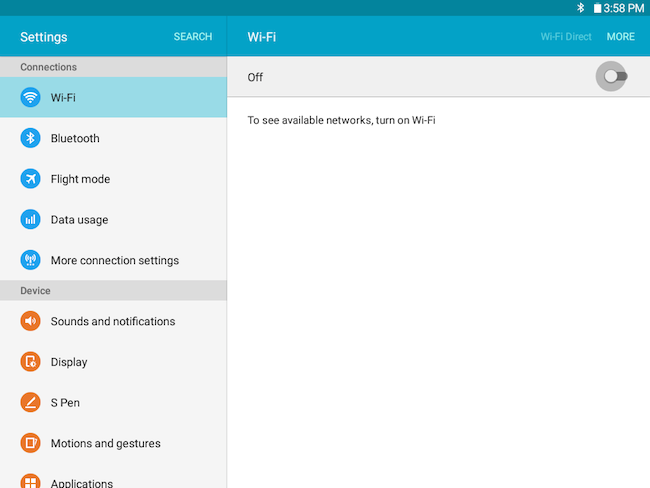 • Add network: Manually add a Wi-Fi network. 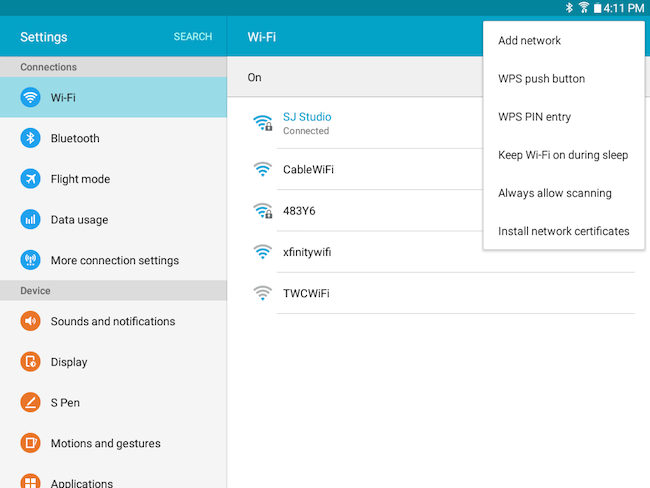 • WPS push button: Set up a connection to a WPS (Wi-Fi Protected Setup) router or other equipment. 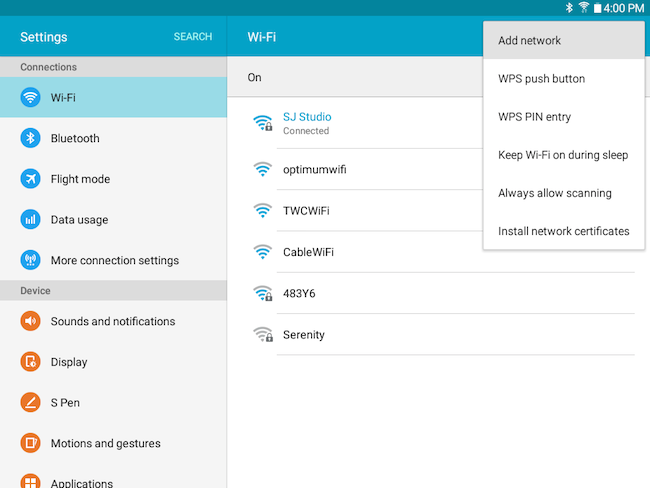 • WPS PIN entry: View the PIN used by your device to set up a PIN-secured connection to a Wi-Fi router or other equipment (not configurable). • Install network certificates: Install authentication certificates. Wi-Fi Direct is a wireless technology that enables Wi-Fi Direct devices to connect directly to one another. This means on-the-go users can print documents, share data, sync files, and display information from notebooks and netbooks as well as from devices like smartphones and tablets. Products certified Wi-Fi Direct can connect to other wireless devices without joining a traditional wireless network or Wi-Fi Hotspot. 3. Your device will scan for other Wi-Fi Direct devices. 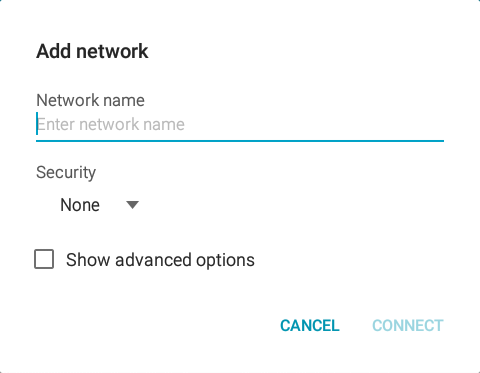 If the device you want to connect to is not listed, make sure Wi-Fi Direct is activated on the other device and it is connected to the same Wi-Fi network. 4. Touch the device name you want to connect to. 5. 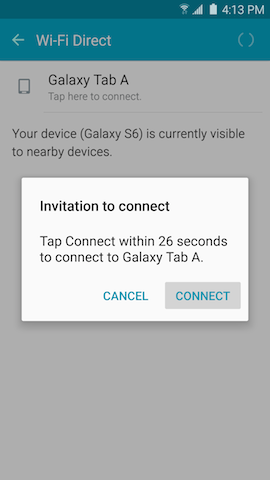 The other device will receive an Invitation to connect prompt, and the user will have 30 seconds to touch CONNECT for the connection to be made. 6. Once connected, the other device will be listed under Connected devices, and the Wi-Fi Direct will display at the top of your screen. 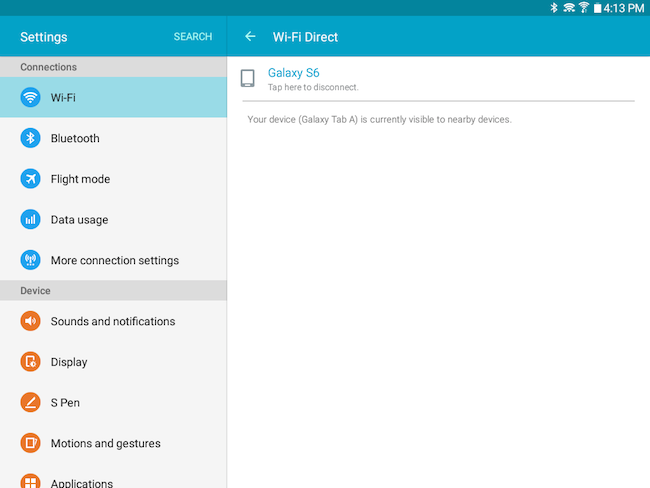 What Location settings (GPS) are available on my Samsung Galaxy Tab E LTE?